LiveCode LessonsLiveCode LessonsHow To - Step-By-Step Guides To Tasks In LiveCode Custom PropertiesHow do I save custom properties in a standalone application? Custom properties are a very useful way to store information, and if you want that information to persist between sessions you can just save your stack and the custom properties are saved and available next time you start it up. But what if you want to use and save custom properties once you have built your application into a standalone? 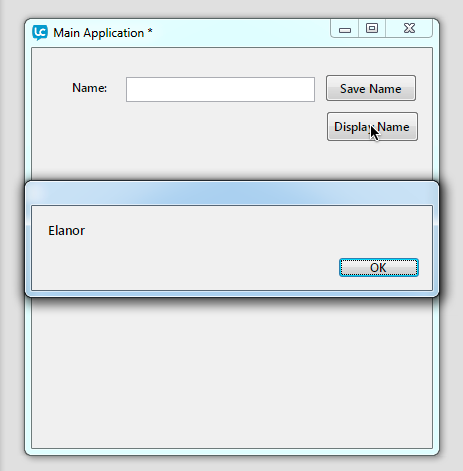 In this lesson we will learn how to create a standalone application consisting of a launcher and an editable file. Firstly we need two new stacks, one will be the launcher and one our main application. From the file menu create a new mainstack and name it Launcher, then create another main stack and name is Main Application. The launcher stack will be built into a standalone and all we need it to do is to open our main application, it can then close itself. Add the following script to the stack script of the launcher stack. Thats all we need to do. The launcher will then open the Main Application stack, which can be modified and saved as it is not a standalone. Now we need a simple test to check that our Main Application can be saved and that custom properties are preserved. set the cName of this stack to field "name"
put empty into field "name"
This means any changes we have made to the stack, including our custom property are saved. Now build the Launcher stack into a standalone. Once the standalone is built copy the Main Application file into the same folder as the standalone. Note, the standalone is an application (.exe) file, even if the extensions does not show, and the Main Application is a .livecode file (not an app). Now close both the Launcher and the Main Application file. Re-open the launcher, you should see the Main Application window open and the Launcher close. Put in your name, save it and check it displays. Now close the application, run the launcher and try Display Name again. The custom property storing your name should have been saved from the previous run. Next: How do I define my own properties for an object? --Any idea how we can secure the .rev file so no one can open it? ---Also This make is easier to update an application from say v1.0 to 1.1. How would that mechanism work. I'm guessing the launcher can check if there is an update and then just replace the old file with the new one? You can password protect the stack using the password property in Rev. This encrypts a stack's contents, allowing access only from within the application. You can also hide the fact that it is a Rev stack by changing the extension. Yes launchers do allow you to update an application, just use the launcher to check for an update, download the new file and launch the most up to date version of the file. You can either overwrite the original or download to an application support or documents folder and just check for the latest version when you are launching. I had a question about how to include database drivers with this "Launcher method" do we add the m to the launcher standalone builder settings? That's correct, when you build your standalone launcher you need to select the inclusions for anything you want your application to have access to, so in this case you would select Database Support and whichever database types you want to be able to work with. Works great with my skin from the recent Game Academy, enabling me to flag whether or not an initial splash screen image should show when returning to the main menu card. Can you say if this is going to work in iOS too? you can keep track of states in the custom properties of the application at runtime, but once the user closes an application, the properties are lost. 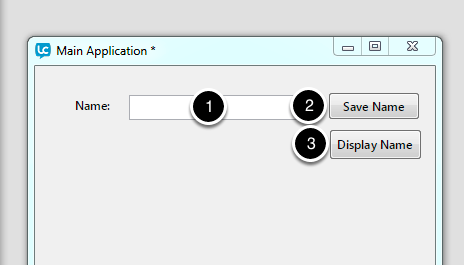 You can save settings to the sandbox of your application and load settings back into your application. This allows you to retrieve any settings once the user opens the application again. Have a look at the the "specialFolderPath" function, the "open file" command, the "write to file" command, the"read from file" command and "close file" command in the dictionary. I am trying but not quite getting this. I follow the instructions given and the program runs as expected when the whole thing is uncompiled in that I enter a name and save it and the name disappears and then when I process display it shows the name in an answer box. However, when I compile "Launcher" and put the main application file into the same folder as "Launcher" and then try to run the program everything seems to work the same way but the display button does not produce an answer box. I am not sure why there is this disparity. My immediate thought would be that the reference to 'stack' in the 'Display' button script is ambiguous and maybe it is interpreting that as referring to the Launcher as the stack instead of the main application. But then why does this not happening in the uncompiled mode as well and of course no-one else seems to have this problem? I would really appreciate some advice on this. I put some more code into the display button. This put the name into a field instead of having it come up in an answer box. The field did produce the name in the compiled Launcher (unlike the answer box), but it did not reproduce it when I closed and then re opened Launcher and pressed 'Display' (which of course is critical to the project under discussion in this lesson). Again, I would really appreciate some input as to what might be going wrong with this for me as the ability to retain information in a compiled program from one session to another is crucial as far as a current project I am working on is concerned. the problem here is that you are loading and running a LiveCode stack from within a LiveCode standalone application. When you create a standalone application, the build process can either automatically include all of the components necessary for the application to run, or you can specify the components that are needed to run. With the example in this lesson, the "Answer Dialog" is not automatically included in the standalone application. You have to include the "Answer Dialog" component manually through settings in the "Standalone Application Settings". Open the "Standalone Application Settings" dialog and select the "General" tab. Ensure that you select "Advanced Options" under the "Inclusions" heading. Then tick the "Answer Dialog" box to include this feature in the standalone. Build the standalone in the usual way and you should now have the "Answer Dialog". Using this launcher (or splash screen) method where only the launcher is turned into a standalone, can the main stack (as a stack file not a substack of the launcher) be loaded with its own substacks (not themselves separate stack files)? I have built an application (main stack) that comes with more than seventy substacks. If to make it available as a standalone I create a launcher that allows the user to open this separate main stack, will it function with all of its own substacks? Many thanks for clarifying this point. yes it should work, but it really depends on the application and what the application is supposed to do. It should not be much effort to set up a test application and see if it runs as expected. I have just tried to password protect a stack file that I added as an additional stack in the standalone build setting. When I then build the application the password & 'encrypt with password' checkbox is cleared. it depends on the edition of LiveCode you are using. If you are using the community edition, then you do not have support for password protection of the LiveCode stacks. The commercial edition does provide this protection. Thanks for the answer Hanson. I was thinking this may be the case. Will be purchasing soon as soon as I figure out a few other things related to mobile. the Launcher Stack is intended to open, load the LiveCode stack and then close again. It looks like it cannot find "Main Application.livecode" or "Main Application.livecode" is quitting. answer there is a file "Main Application.livecode"
Add this to your Launcher Stack code before you close it. This should raise a dialog with either true or false, indicating if the application that is to be launched, can be found. The nice thing with answer is that it will block until you press the button. So you know that if you do not get a dialog, then you have not yet hit that bit of code. The code did not work on Mac until I set the correct folderPath. put the result && "("& sysError() &")"
close stack "Format My URL Launcher"
--put "Messages" into fld "fMessages"
Hi Russell, I just tested a very simple "Main application" with a browser widget and it worked ok. What platform are you on? Mac. I used the bug report on the standalone build and it came back that it was not recognising “put url into tvari” I.e. I cannot test as to whether tvari is not empty and that the user has an internet connection and has clicked on a live url. The workaround is to not test and so, if there is not internet connection, you just get a white box. Obviously not as good as being able to bring up a dialogue saying “please check your internet connection etc”. You could also use some of the browser widget messages to detect if loading a URL has failed, browserNavigateFailed might be a good place to start. You can find the browser widget messages and properties by filtering the Dictionary using the Associations list or by searching for "browser" and selecting the entry for the browser widget which includes a list of all the browser widget messages and properties. Thanks for your help. I'll try the widget value.